Using the essential oils in your cooking really makes the meal “POP” it is not necessary, but, if you have them handy use them for a great tasting meal sure to please. NO RETAIL STORE OILS PLEASE as I cannot guarantee their safety and purity for ingestion. 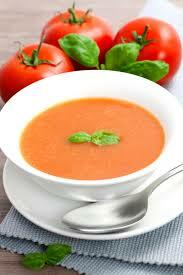 Core tomatoes, chop into 1 inch chunks and place them along with their juice in a large stockpot. Add 12 oz chicken broth and bring to a boil. Lower heat, cover and simmer until tomatoes are soft. Allow mixture to cool slightly and pour mixture through a large colander or sieve, press with a wooden spoon to get out all the liquid possible. Discard seeds and peels. You should have about 3 1/2 quarts of liquid. In another stock pan heat oil and butter. Once butter is melted add the onion, celery, carrot and peppers, and saute until soft, about 5 mins. Add salt, pepper and basil and saute another 5 mins. Reduce heat to low and gradually add flour, stirring to make a thick paste. Slowly add 1 quart of tomato liquid stirring until smooth. Stir in tomato paste and remaining liquid, and another 12 oz chicken stock and chicken bullion. Simmer for 1 hour stirring occasionally. When ready to serve, remove from heat and stir in the cream. Taste to adjust the seasoning if needed. Make a big hearty salad to go with this!